Fiction is winning, but only just. Generally, we only think about shelving books by broad subject topics or alphabetically. 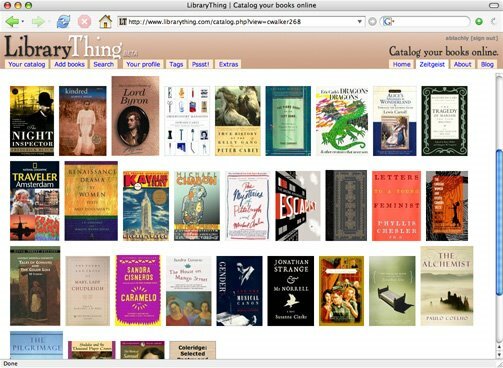 Thanks to the tags, LibraryThing shows you how books you'd never put together as neighbours in a bookshelf might have much in common thematically. The geeky part of me that wanted to be a librarian once, approves. I love the widget that shows you books from my library in the sidebar of my blog, changing every 20 minutes so you can admire all those pretty covers. And now, if you look just below that, there's a search tool so you can find out more easily what I have and in some cases, how I rate it. A good place to waste time! I only have TWO authors in my portrait gallery... i'm jealous with your 92! But then I only have 13 books logged in so far... I'm entering my books as I read them. So far it's been a book a week. So far so good! btw - what do you think those two authors are saying to each other? Hmm... that's an interesting thing to ponder... what would Stephen Fry say to Haruki Murakami? I cannot imagine! I didn't know there are author's pictures! Thanks for the info. Wow! I don't know when I'm going to get around to listing the rest of my books in storage (I need more bookcases, but I'm afraid the earthquake retrofitting of my building won't support their weight!). jiwa rasa - your're welcome!